Did you correctly guess what “IHOB” stands for? Today, the pancake house chain announced that they’re changing their name to “International House of Burgers” — and the internet flipped. The rollout engaged their online community over the course of a week, fostering a collective intrigue and excitement about the brand’s future. The hypothetical switch to “International House of Breakfast” made sense. With both IHOP and its sister company Applebee’s (both owned by parent company Dine Brands) shuttering plenty of stores in 2018, many have looked to millennial dining tastes to offer an explanation — after all, millennials are stereotypically known for their upscale, photogenic brunch preferences, where avocado toast is anointed with Instagram-ready Himalayan pink sea salt and the cocktail menu features bottomless mimosas. IHOP’s stacks of flapjacks and signature white coffee mugs seem staunchly uncool by comparison, a throwback to a bygone era of American diner fare and family breakfasts. So when IHOP first announced this “rebrand,” some wondered whether this would encompass an attempt to appeal to younger, hipper diners, who have come to view IHOP as a place they only go with their parents. In recent years, Denny’s has managed to recapture its share of the youth market by branding itself as a social media-savvy hangout spot for teens, filling its social channels with memes and targeting the Gen Z customer who wants a place to eat and spend time with friends. 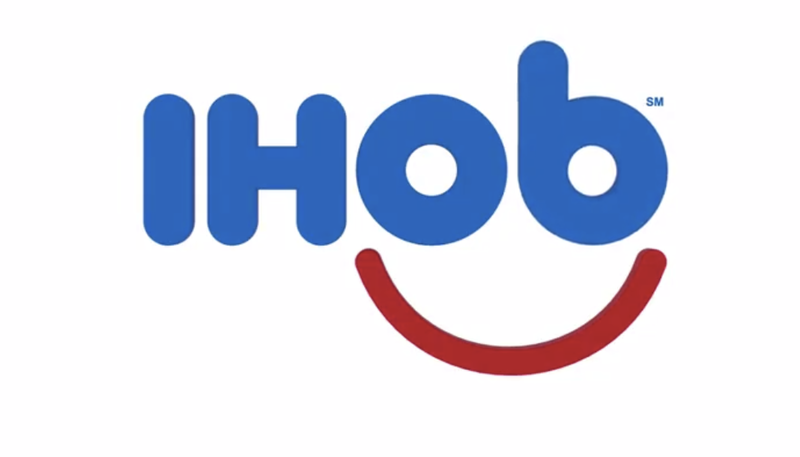 Could IHOP pull off the same branding feat? Well, probably not with burgers alone. But the fact of the matter is, all burgers aside, this is a great campaign. In 2018, it’s hard for a brand to break through the noise of the fast-moving news cycle and never-ending political outrage unless it’s doing something supremely offensive. But the IHOB rebrand offended no one, aside from perhaps those who find the concept of a “Big Brunch Burger” appalling. What’s the secret? IHOP got audiences talking about what they really like about their brand: pancakes. Let’s face it: no one goes to IHOP for the Philly Cheese Steak Stacker or Chicken Cobb Salad. IHOP is a pancake joint, and pancakes are what they do well. It’s a legacy brand, where the “IHOP experience” is first passed down from parent or grandparent to child at a young age. Everyone has fond memories of a loved one taking them out for pancakes when they were young. America is oversaturated with burger joints, but when it comes to the humble pancake, IHOP and Denny’s have cornered the market. This isn’t a risk-avoidant branding campaign. It’s not data-driven and serious, or even permanent. In fact, it’s downright silly. Why would you go to IHOP for a burger, anyway? Sure, it might be nice to have the option on the menu — but it’s not going to be the company’s new selling point. But then again, when was the last time you pondered what you like about the International House of Pancakes?